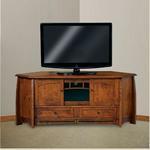 Handcrafted from solid wood in a small Amish wood shop right here in the USA, this exceptional solid wood corner TV stand is a masterclass in classical style and modern functionality. 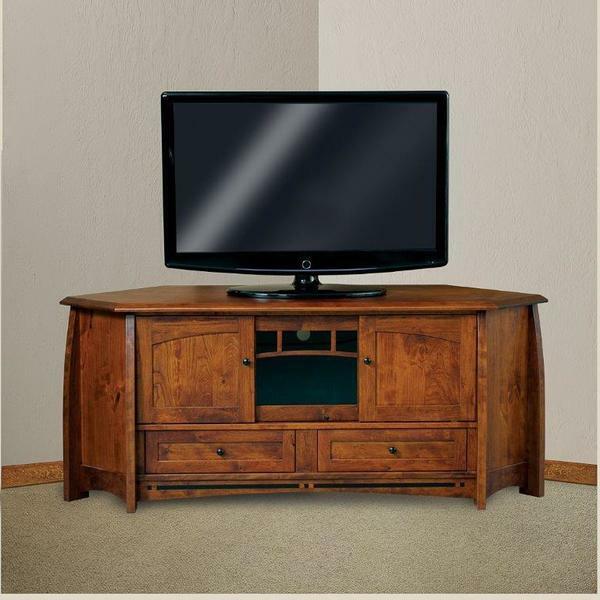 From start to finish, the Boulder Creek 69" Corner TV Stand showcases pure quality and an exceptional, heirloom-quality look and feel, bringing new dimensions of enjoyment to family movie nights, big games, and more. Your Boulder Creek will be built, sanded, and finished to order in your choice of wood and stain. To get started, just select your perfect pairing from the menus above. If you've any questions at all, please don't hesitate to get in touch with us by email or by phone at any time - we love the traditional warmth of this piece's design, and we would love to talk with you about the decades of happy memories it brings to the home. Shown in Rustic Cherry with Michaels' cherry.